The first time I visited Dublin Castle, I was just 14 years old. My family was a long way from our Florida home, and I was so consumed by the excitement of it all that now I hardly remember it. (I do remember my sister plopping me into a bathtub after I consumed way too much mead.) Now I wish I’d had a better head on me, for the castle will be the primary setting for my next book. Research already had begun last month when my sister unearthed this picture of me on the throne. Is it any wonder that I’m drawn to Irish history as much as I’m drawn to write? What tourists see today is not the Dublin Castle of my story, however. Founded by King John in 1204 for the defense of the city, the original castle had a circular tower and strong walls around a broad square that was filled with wooden structures for the business of castle daily life. But most of this was lost to fire in 1684. The tower survived, and around it a new Georgian Palace was built to house government offices and activity, house the Lord Deputy, and host state dinners and other events. Today the castle is quite a sprawling complex that even offers a conference center. Visitors can tour historic State Apartments, including St. Patrick’s Hall, the throne room, dining room, bedrooms, and state corridor. They can also seem some remnants of Medieval life, and much more of modern life. But I will be looking for the Castle of the 1630s and 40s, just prior to the Great Rebellion of 1641. The story I’m researching centers on the Lord Deputy of Ireland, Thomas Wentworth, the First Earl of Strafford. He was vice regent for King Charles I, and did much to fill the king’s treasury during his tenure in Ireland, but managed to enrich himself at the same time. He offended many a powerful earl in the process, and this ultimately led to his downfall and execution in 1641. As the son of a great Irish warrior, Faolán Burke should have inherited vast lands and a beautiful castle, Glencurragh. But tensions grow in 1634 Ireland, as English plantation systems consume traditional clan properties, Irish families are made homeless, and Irish sons are left penniless. Encountering the beautiful heiress Vivienne FitzGerald, Faolán believes together they can restore his stolen heritage and build a prosperous life. Because the Earl of Cork protects her, abduction seems to be his only option. But Vivienne has a mind of her own; the adventure that begins as a lark takes a dark turn, and plans go awry. 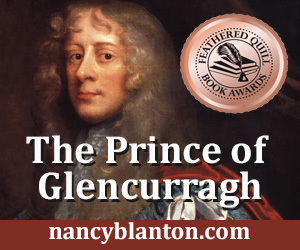 Faolán finds himself in the crossfire between the four most powerful men in Ireland—the earls of Clanricarde, Cork, Ormonde, and the aggressive new Lord Deputy of Ireland—who use people like game pieces. With events spiraling beyond their control, what will become of Faolán, Vivienne, and the dream of Glencurragh? Available in hard cover, soft cover and e-book. Sign up for the Goodreads Giveaway now through Sept. 10. Or, purchase it today and embark on the adventure!